Originally published under the title "Fifty Years After the Six-Day War." 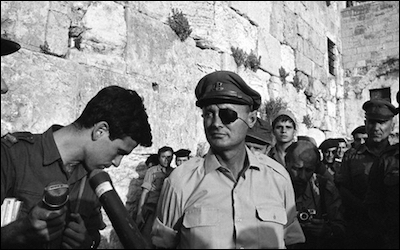 The symbol of victory: Moshe Dayan (with eye patch) at the Western Wall in Jerusalem, June 1967. Israel's military triumph over three enemy states in June 1967 is the most outstandingly successful war of all recorded history. The Six-Day War was also deeply consequential for the Middle East, establishing the permanence of the Jewish state, dealing a death-blow to pan-Arab nationalism, and (ironically) worsening Israel's place in the world because of its occupation of the West Bank and Jerusalem. First, Israeli leftists and foreign do-gooders wrongly blame Israel's government for not making sufficient efforts to leave the West Bank, as though greater efforts could have found a true peace partner. In this, critics ignore rejectionism, the attitude of refusing to accept anything Zionist that has dominated Palestinian politics for the past century. Its founding figure, Amin al-Husseini, collaborated with Hitler and even had a key role in formulating the Final Solution; recent manifestations include the "anti-normalization" and the boycott, divestment, and sanction (BDS) movements. Rejectionism renders Israeli concessions useless, even counterproductive, because Palestinians respond to them with more hostility and violence. The Israelis vastly increased (the lined area) the size of Jerusalem on unifying it. Second, Israel faces a conundrum of geography and demography in the West Bank. While its strategists want to control the highlands, its nationalists want to build towns, and its religious want to possess Jewish holy sites, Israel's continued ultimate rule over a West Bank population of 1.7 million mostly hostile Arabic-speaking, Muslim Palestinians takes an immense toll both domestically and internationally. Various schemes to keep the land and defang an enemy people – by integrating them, buying them off, dividing them, pushing them out, or finding another ruler for them – have all come to naught. 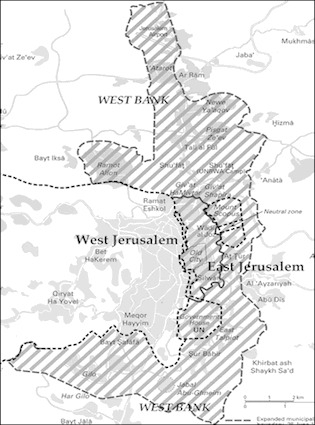 Third, the Israelis in 1967 took three unilateral steps in Jerusalem that created future time bombs: vastly expanding the city's borders, annexing it, and offering Israeli citizenship to the city's new Arab residents. In combination, these led to a long-term demographic and housing competition that Palestinians are winning, jeopardizing the Jewish nature of the Jews' historic capital. Worse, 300,000 Arabs could at any time choose to take Israeli citizenship. Invited back in the Jordanian authorities, rulers of the West Bank since 1949, to run that area's (but not Jerusalem's) internal affairs, leaving the Israel Defense Forces with only the burden to protect borders and Jewish populations. And today, what can Israelis do? The Jerusalem issue is relatively easy, as most Arab residents have not yet taken out Israeli citizenship, so Israel's government can still stop this process by reducing the size of Jerusalem's 1967 borders and terminating the offer of Israeli citizenship to all the city residents. Though it may lead to unrest, cracking down on illegal housing sites is imperative. 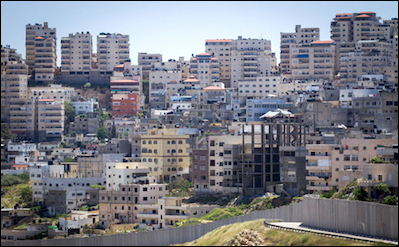 The illegal buildings in the "refugee camp" of Shuafat, located within Jerusalem's 1967 borders. The West Bank is tougher. So long as Palestinian rejectionism prevails, Israel is stuck with overseeing an intensely hostile population that it dare not release ultimate control of. This situation generates a vicious, impassioned debate among Israelis (recall the Rabin assassination) and harms the country's international standing (think of U.N. Security Council Resolution 2334). But returning to 1949's "Auschwitz lines" and abandoning 400,000 Israeli residents of the West Bank to the Palestinians' tender mercies is obviously not a solution. Instead, Israel needs to confront and undermine Palestinian rejectionism, which means convincing Palestinians that Israel is a permanent state, that the dream to eliminate it is futile, and that they are sacrificing for naught. Israel can achieve these goals by making victory its goal, by showing Palestinians that continued rejectionism brings them only repression and failure. The U.S. government can help by green lighting the path to an Israel victory.